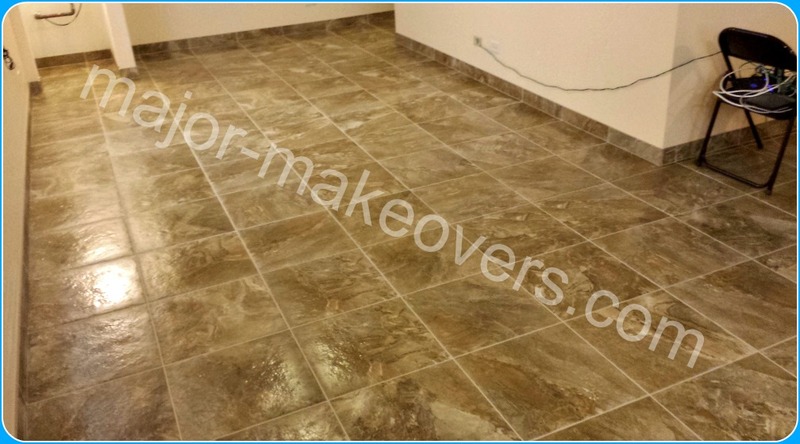 The following pictures show just a few of the many tile installation projects completed by Major Makeovers throughout Chicago and suburbs like Burr Ridge, IL 60527, Hinsdale, IL 60521, Oak Brook, IL 60523, Willowbrook, Naperville, Westmont, Western Springs, Clarendon Hills, Darien, Tinley Park, Downers Grove, Lemont, Orland Park and others. 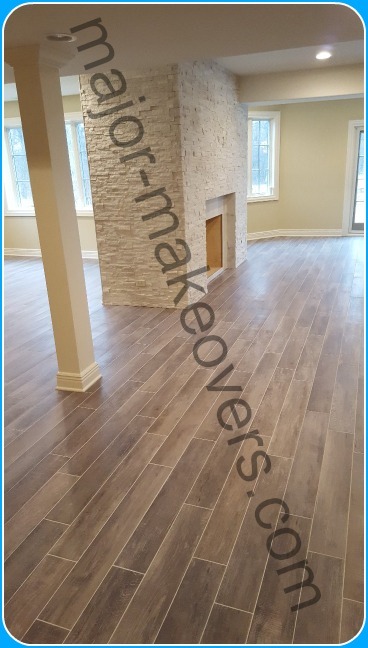 This Burr Ridge basement measures more than 2,400 square feet (SF) and the chosen tile to be installed was 6 by 39 inch wood-look Capella Ash porcelain tile. The tile imitates the gray-ish look and color variety of very old wood seen on the outside of barns or other very old wooden structures exposed to weather. Differences between the 2 pictures below are due to a combination of light amount, camera angle and how wet/dry the floor was when the picture was taken. The stone seen around the 9 ft. high fireplace walls, came from The Tile Shop and the same is true for the white marble around the opening of the fireplace. This Hinsdale backsplash is made with mesh backed glass and stone tile strips of different widths and lengths which come in a mixture of white, black and gray. The combination provides a blend/connection between black countertops and white cabinets. Add to that the under cabinet light which is increased by the glass reflection and you have lots of light to comfortably enjoy your kitchen. This is a very big kitchen and the backsplash is spread in 4 separate areas while these pictures only show 2 of those areas. One of the features of this kitchen is having this 2-level countertop right next to each other where the backsplash tiles have to perfectly follow the 'step up/down' from one level to the other. 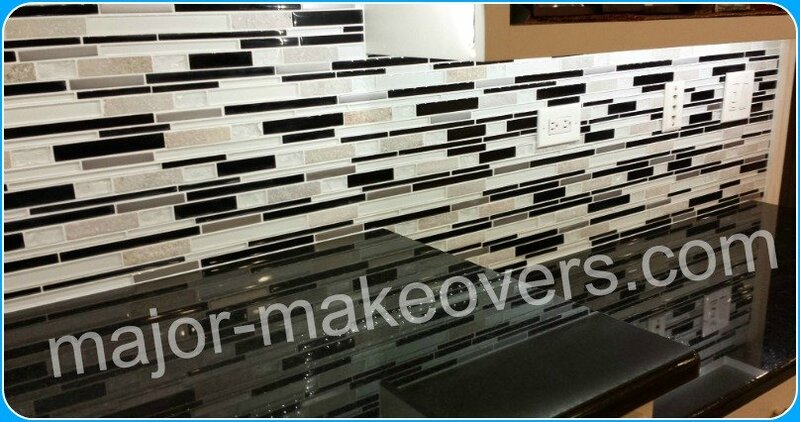 Backsplash & Countertop 'Step' Up/Down. This 9 by 12 in. ceramic tile was installed all around the tub walls in one of the upstairs bathrooms of this Hinsdale home. The pattern is brick-style, same as seen in most brick buildings. There's also a matching bullnose tile which runs on the sides and top of the regular tile to finish the edges. Two corner soap dishes were also installed per customer's directions, to hold plenty of shampoo bottles and other items. A decorative tile line runs from side to side at about a height of 5 ft. from the bathroom floor. This decoartive tile line is made from random broken pieces of travertine tile glued to mesh. It's a good match with the colors found in the light grout and brown ceramic tile. This shower has 12x12 ceramic tile on walls and the same tile is also installed on the ceiling. Two light colored corner soap dishes are placed on the sides of the shower faucet. A 4 in. decorative tile line cut from mosaic tile sheets, runs horizontally between the faucet and shower head. White grout makes the black tile stand out individually and a can light in the shower's ceiling makes sure there's plenty of light in a black tiled shower. Give that the shower was an addition to the existing basement bathroom, its size was limited by the available space so even though it's not a very big shower, most people would prefer having a smaller shower in the basement versus no shower at all and that's why this homeowner chose the same. 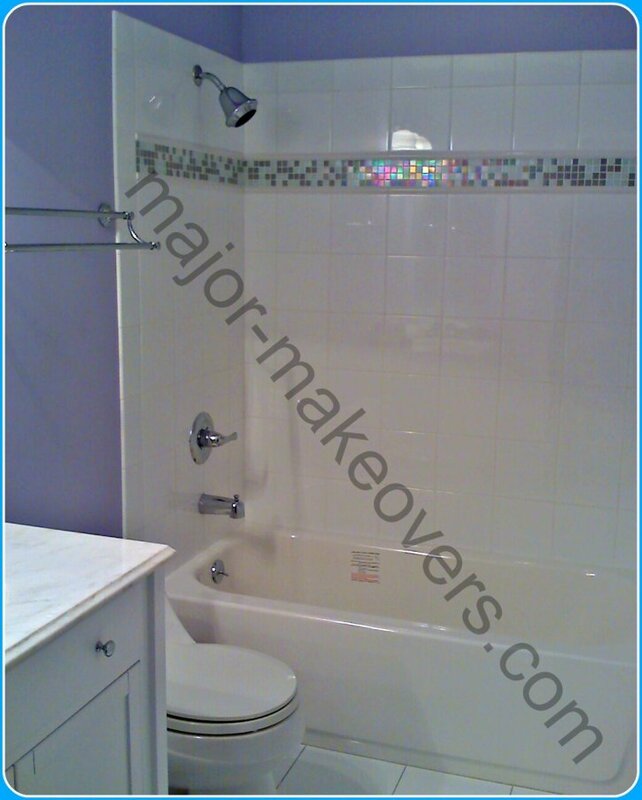 This Oak Brook bathroom was actually a full bath project and except the purple wall paint color, everything else was geared towards plain clean white. The tub surround walls got 6x6 in. 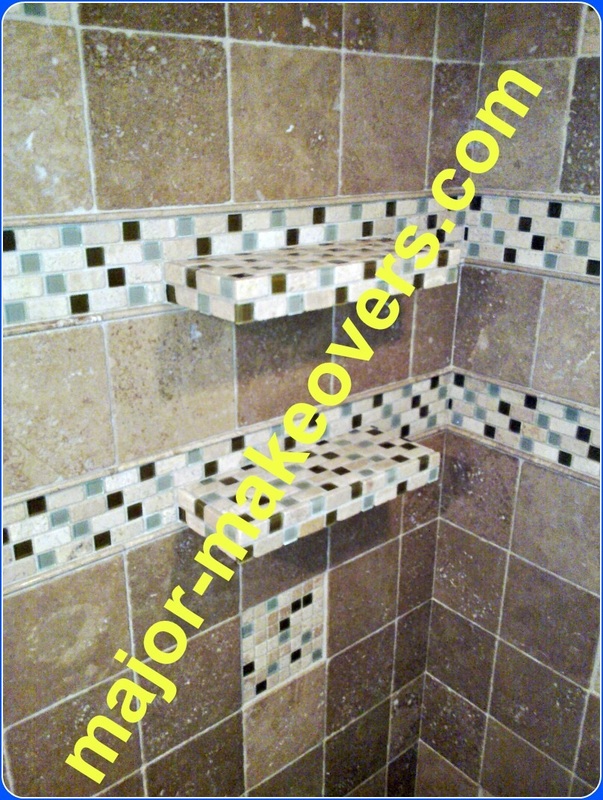 ceramic tile with matching length bullnose tile completing the edges and top. A 2 tone decorative mosaic tile line runs at about eye-level height and has white pencil tile running at the top and bottom. Floor tile is 13x13 inch and the new vanity and countertop sink stay within the white theme as do the toilet and tub which generally are white. 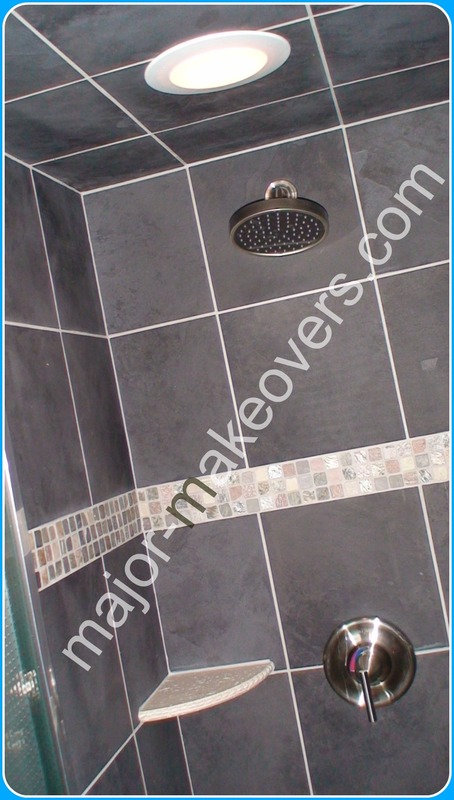 The above picture shows the completed shower floor which is made from pieces of stone tile on mesh. The top of the L shaped shower curb is made from 3 pieces made specifically for that purpose. 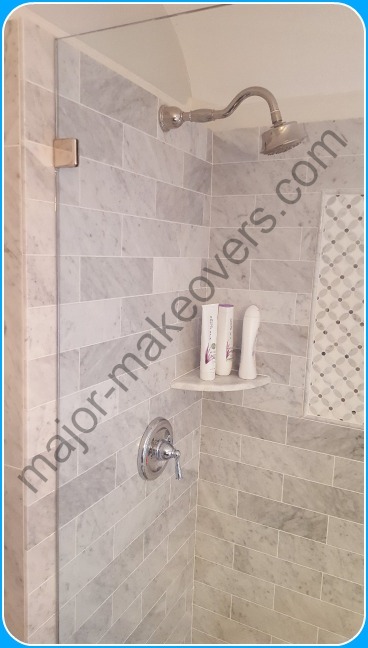 Wall tile is 4 x 12 marble installed in a brick style. There's a corner shoap dish and an intricate mosaic tile surrounded by pencil tile installed on the long shower wall. 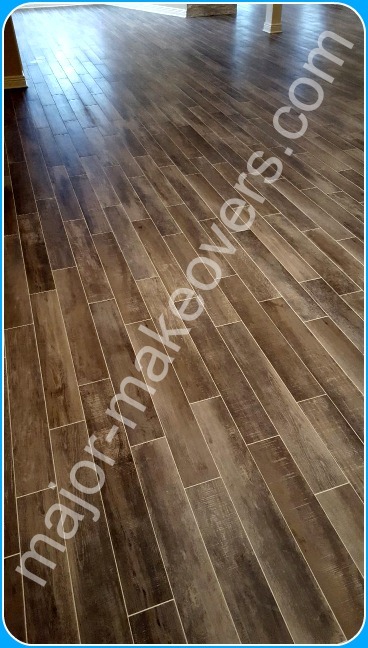 The floor tile is a gray-ish wood looking ceramic tile at 12 by 24 inches in size also installed in a brick pattern per customer's preferences. The shower glass side panel and glass door were installed and this bathroom project was just about done. A brown thin metal transition was installed to match as closely as possible the hardwood floor on hallway. Besides glass tile strips or mosaics, this diamond shape tiles with rounded/curved sides are quite time consuming and difficult to install especially on a small area like a backsplash where so many perfect cuts need to be made. These tiles came from the manufacturer in sheets of 8 pieces each but given that there's not one straight side/edge, lots of cuts are needed even to start setting the first row of tile beginning on the countertop. Cutting around outlets and switches is also more time consuming than if the tiles were square or rectangular. If you really like the look and you're willing to go ahead with a higher installation price, you can definitely have a backsplash like this. 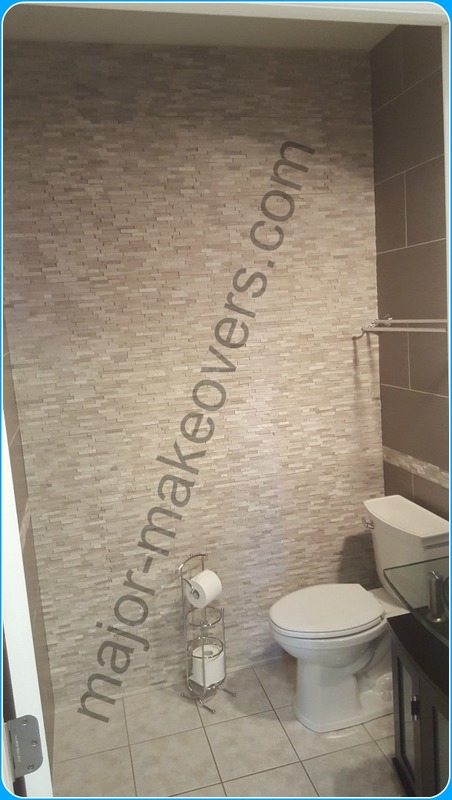 This is quite a rare sight but some homeowners do choose to tile their powder room walls all the way up to the ceiling as you can see in the pictures below. Three of the 4 walls got 12 x 24 inch grey porcelain tile installed in a brick style and there's a stone decorative tile line running all around at about 3 ft. from the floor. The 4th wall was covered in interlocking uneven stone sheets that provide quite an interesting look especially being right across from the door. These stone sheets are not meant to be grouted - therefore they should not be installed on shower walls. The homeoner decided to keep the old floor tile in place as they were a part of a big area of the house's first floor - we only installed the wall tile. Save this 20% discount at The Tile Shop to use now or later. This is a 2,300 SF tile instalaltion project that was done way back in 2008. The tile is 18x18 ceramic in brown and white while the grout is black. The particular tile layout was chosen by the church and we installed it accordingly. Each of these round tiles is bigger than the average steering wheel ! Most people seeing this big round tile installation for the first time are a little shocked because, let's face it, this is not something one sees every day (except the homeowner who chose this circle tile). They also chose the exact location of each green-ish tile to be placed among the blue ones. If you look closely, you can see the triangle tiles that perfectly fit within the circle tile. Half of these triangle tile are light colored and half are green-ish and they are all placed in alternate rows based on their color. 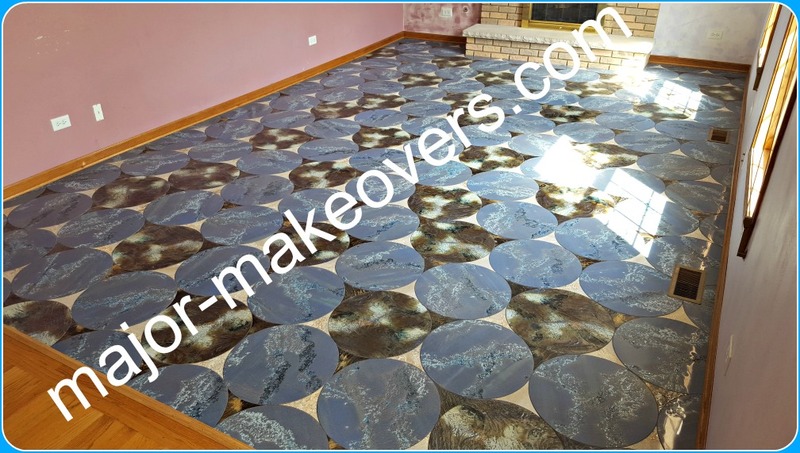 The homeowner had a hard time finding the right tile installation company to tackle this project when 3 other tile companies did not have the knowledge/skills to install big circles and small triangle tiles and/or they did not want to take any chances. 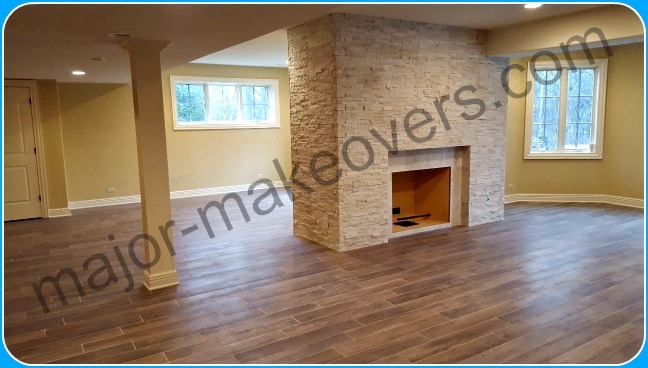 We did this round tile project in early 2016 based on customer's specifications. 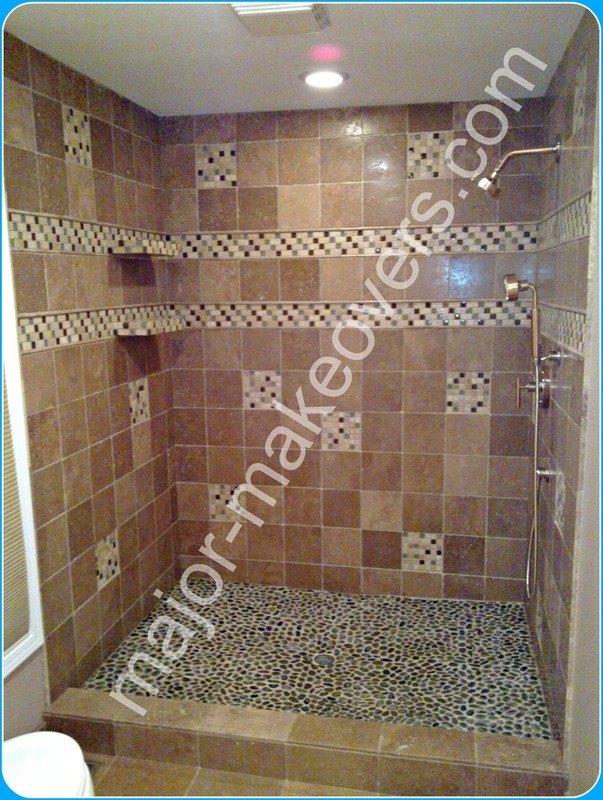 This shower is quite big at 24 SF (4 by 6 feet) and wall tile is aproximately 6x6 in. The homeowner chose the random placement of all 6 inch mosaic square inserts and the exact height of both horizontal decorative mosaic tile lines. Both these lines have pencil tile running above and below the mosaic and the pencil tile also runs vertically from the top of shower curb up to the ceiling instead of what otherwise would have been bulnose tile. Hard to notice at this eye-level view are 2 custom handmade 'floating' shower shelves that have no visible outside support - they 'come' out of the wall and each is 6 by 18 inches big, offering a lot of shelf space for many shower items. 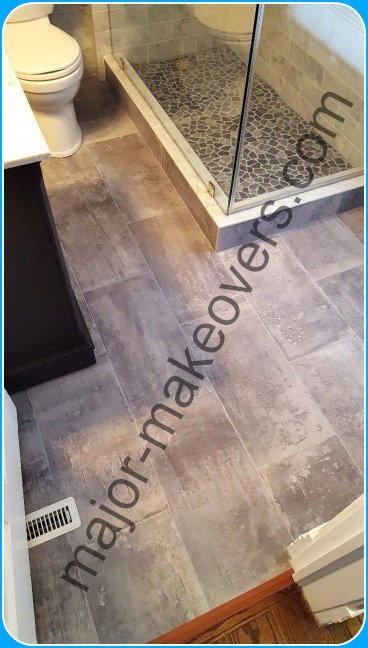 The beautiful natural color variety of travertine tile continues from the walls to the shower curb and the rest of this Oak Brook master bathroom floor, but the tile size increases to 12 x 12 in. 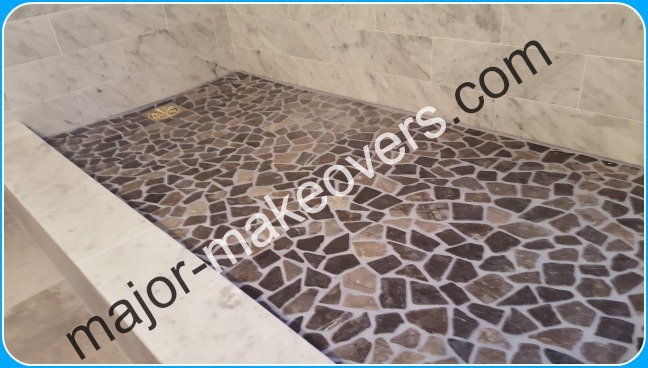 The shower floor is made of pebble tile that was sealed with a special sealer enhancer to protect and enhance the color of each stone. Having rounded stones on one's shower floor, a sort of a foot masage may also be 'provided' while taking a shower. The travertine was sealed twice as this material is very porous and can get stained even by the grouting process (especially by dark grout colors) if left unsealed. 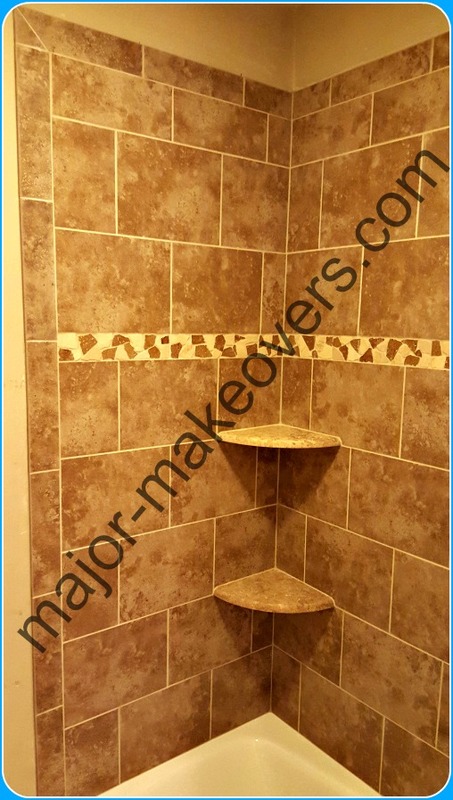 Here's a closeup on the shower shelves and you can also see the natural variety of 'imperfections'/small holes throughout the travertine tile that get filled with grout. This may very well be the smallest backsplash tile installation area we've ever done in 15+ years. It's slightly wider than the cooktop and is made to perfectly fit between the cabinets. The white round border tile runs on both sides to finish/cover the tile edges and is cut at a 45 degree angle at the top where it turns and a small piece fits by the range hood on both sides. 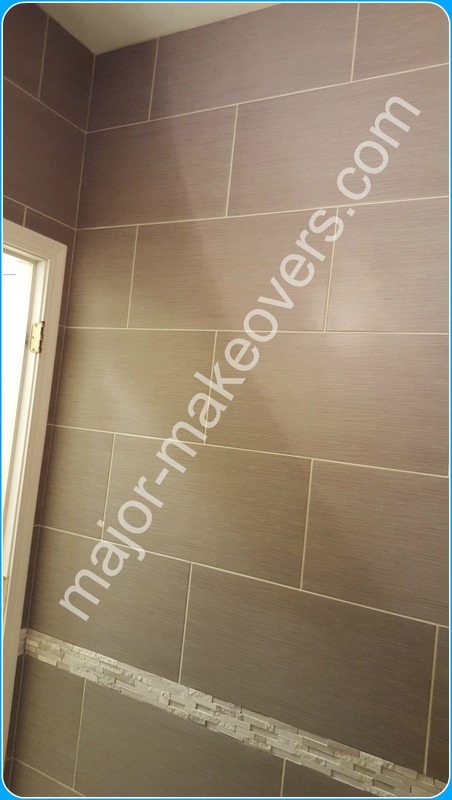 The tile is a very wavy gray surface and measures at around 4 x 12 per full piece and it's installed in a brick layout centered in between the white tile frame/border. This tile is 18x18 inch porcelain and covers most of this basement in Minooka, IL. The matching baseboard tile seen in this picture is actually made/cut by us in 4 in. tall pieces from the same 18x18 tile. Four pieces of baseboard were 'made' out of one full tile and they covered 6 feet in length (4 pcs. x 18 in. long = 72 in which is 6 ft long). This is probably the best way to get perfectly matching baseboard when the tile you choose doesn't come with its own baseboard or bullnose tile from the manufacturer. This is just a small part of this Orland Park backsplash that was installed with brown-ish mesh backed interlocking sheets of glass tile. 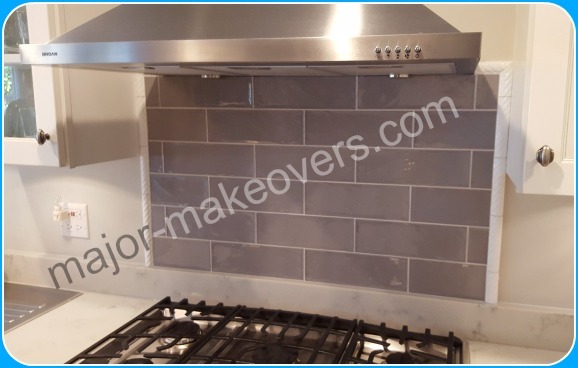 Usually with backsplashes, it's hard to take one picture of the whole project because you end up with a picture of the whole kitchen when the point is to show the actual backsplash tile - therefore the 'backsplash level' picture shown below. Individual glass pieces were taken out of the same product and used as a perfectly matching trim to finish off all exposed egdes where the glass tile had to be cut straight (see the vertically running glass tile at left and right ends of backsplash). This tile size is 6 x 36 in. 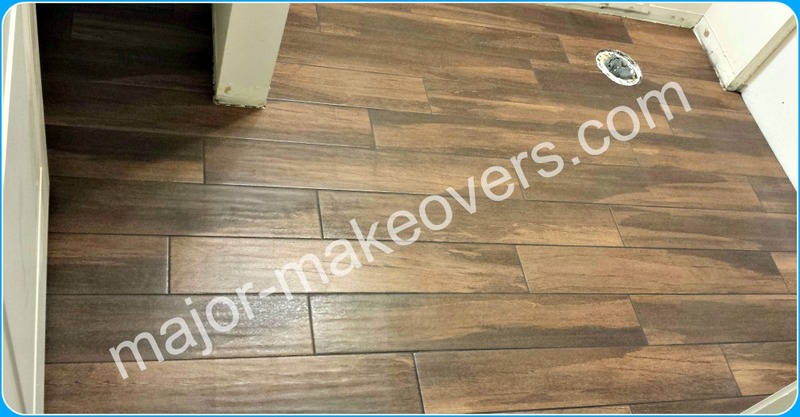 porcelain and imitates the brown-ish look of stained wood boards while the grout color chosen by the customer is black. The unfinished bottom of the walls (no baseboard or wainscoting yet) was a future project to be decided by the homeowner/designer, not part of our tile project. This Hinsdale customer special ordered their backsplash tile from a small family business that was manufacturing their tile pretty much by hand. The business is gone for a few years now but this backsplash lives on. These tiles had unique characteristics like very uneven edges that were also sticking out and there was quite a difference in tile width/length. Small adjustments were needed to make the tiles fit and you can see the result below. The image only shows one part of this Hinsdale kitchen backsplash an the other side was about twice this size but harder to take a clear picture. The tiles are a close color match with the new granite countertops and their rustic handmade look probably goes well with the new rustic-looking cabinets.